Kibale Forest National park is located in the western part of Uganda sharing the districts of Kabarole and Kamwenge and is 358km surface transfer from Kampala the Uganda’s capital city and 26km from Fort Portal the largest town in the area. Kibale National Park is entirely forested landscape that stretches to 795km2 of land coverage and it is one of the mature remaining tropical rain forests in Uganda. Kibale is a biodiversity hot spot with 351 tree species and some of these trees have been in existence for over 200 years and they are about 50m high Besides trees, Kibale has 70 mammal species, 13 primate species including common chimpanzee and 375 species of birds which combine to make Kibale National Park a thrill while on your Uganda safaris. It was first gazetted as a forest reserve in 1932 and in 1993 it received a national park status to enhance the protection of its biodiversity which meant that the management of Kibale switched hands from National Forestry Authority (NFA) to Uganda Wildlife Authority (UWA). The park has got a wildlife corridor over 180km long that adjoins it with Queen Elizabeth National Park facilitating the transfer to wildlife especially elephants between these two destinations. Kibale is a re-known ecological hotspot that does not only draw the attention of Uganda safari undertakers but also that of researchers and academia no wonder it houses the Makerere University Biological Field Station (MUBFS). Dubbed the primate capital of the world, Kibale National Park has great primate concentration in the whole of Africa which include; common chimpanzees, L’Hoest’s monkey, red colobus monkey, black colobus (Colobus satanas), Mangabey (Lophocebus ugandae), the blue monkey (Cercopithecus mitis), Vervet Monkeys, Olive baboons among others. The park also contains forest elephants, bush pigs, and buffaloes, red and blue duikers. Kibale also has carnivores like leopards, bush pigs, two species of otter and three species of duiker. Lions are known of paying occasional visit to the park. Kibale National Park also contains 375 bird species among which include; the Western Green tinker bird, olive long-tailed cuckoo, two pitta species (African and Green-breasted) and African Grey Parrot. The ground thrush (Turdus kibalensis) is endemic to Kibale National Park. Regarding its surroundings, the Batooro and Bakiga tribal groups thrive around the park with their interesting traditions and practices. All this can be explored while on safari tour in Uganda. Kibale National Park is a home to 375species of birds posing a rich ground for birding attraction that is also cherished by Uganda safari undertakers. The adjacent wetland of Bigodi is ahokme to 138 species of birds which all combine to attract birderd to the area. Some of the birds in Kibale include; Blue-headed blue eater, Nahans francolin, masked apalis, White-naped Pigeon, Cassin spine tail, Crested fly catcher, Green- brested Pitta, Red Winged Francolin, Joyful Greenbul, Red- chested fluff tail, Grey winged Robbin, Abyssinian Ground Thrush, Yellow-billed Barbet, Yellow-spotted Barbet, White-spotted Flufftail, Hairy-breasted Barbet, Western Nicator, White-tailed Ant-thrush, Grey-winged Robin-chat, Brown-backed Scrub-robin, Superb Sunbird, Black-and-white Shrike-flycatcher, Brown-crowned Tchagra, White-breasted Negrofinch, Brown-throated Wattle-eye, Black Bishop, Black-crowned Waxbill and Bocage’s Bush-shrike. Kibale National Park has been dubbed the primate capital of the world due to its primate populations. The park has 13 species of primates including the common Chimpanzees which is man’s closest relative sharing 99% of our DNA and these species have been habituated for a thrilling chimpanzee trekking encounter to enable you get closer to them than ever before. Alongside Chimpanzees, Kibale is a home of other 12 primate species among which include; l’Hoestes monkeys, black-and-white Colobus monkeys red-tailed monkeys, vervet and blue monkeys, red Colobus monkeys, grey-cheeked mangabeys and four nocturnal primate species (pottos and bush babies). Kibale National Park also has other wildlife species apart from primates. The forest supports counts of bush pigs, forest elephants, buffaloes, Blue, Harvey’s and Peter’s Duickers and Bushbuck. Kibale National Park has 60 mammal species including; Alexander’s Cusimanse, Ichneumon, Swamp Otter, Banded and Marsh Mongooses, Ratel (Honey Badger) and African Palm Civet. Other rarely seen species that have been recorded in the park include; Leopard, Serval cat, Golden Cat, Hippopotamus, Lion, Giant Hog and Warthog. The elusive Sitatunga thrives in the swamps of Bigodi. Kibale National Park is entirely comprised of forest cover which justifies its great floral concentrations. The greater part of the forest is marked by mature forest while other areas have patches of regenerating forests justifying the human settlement in the forest. The park has 351 species of trees among which count to 200 years old and over 50m in height. The ecological setting of this forest present opportunity for leisure encounter and educational tours while of Uganda safaris. This remarkable flora presents a perfect escape from the artificial gardens to typical natural lush that will leave you in a state of wonder. The Ndali – Kasenda crater is a volcanic field that is marked by a range of crater hollows and lakes which are differently crafted presenting impressive scenic view while on safari in Uganda. According to the local legend, the lakes were created by Ndahura who is the first Muchwezi King who retreated to the area after abdicating the throne in favor of his son Wamala. Holding that aside, the lakes are vivid relics of the immense volcanic and geological forces that have molded the western Uganda landscape and the crater lakes are thought to have been formed about 1000 years ago. They comprise of over 60 permanent and seasonal fresh water lakes about 30 – 40km from Fort Portal. Kibale National Park is famously known for these two activities. The primate walk in Kibale is a very thrilling encounter for Uganda safari undertakers. Chimpanzees in Kibale are fully habituated and the chimp trekking activity commenced as far as 1993 which puts the chances of spotting chimpanzees in Kibale high above other destinations. The Chimpanzee trekking encounter commences at 08am in the morning and at 2pm in the afternoon and it tends to last between 2 – 5 hours including one full hour of direct interaction with them. The Chimpanzee trekking encounter goes beyond Chimps as it involves hiking the lush forested landscapes dotted with counts of birds, other primate species and other wildlife species. Besides Chimpanzee trekking, there is Chimpanzee habituation. The chimpanzee habituation commences as early as 6am in the morning to catch up with chimpanzees as they leave their nests. It takes the whole day and Uganda safari undertakers on this activity enjoy the sights of chimpanzees as they set out to feed, copulate, hunt, patrol, rest and display until they set for overnight at 7pm. 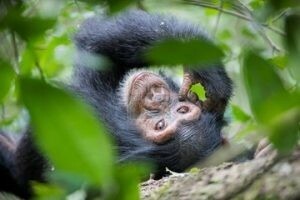 The activity is designed to enable you explore Chimpanzees in detail. Kibale with 375 bird species presents ideal bird watching encounter while on birding safari in Uganda. The birding encounter in Kibale can take the full day or couple of hours depending on the available time. It is better to start early in the morning from the Kanyanchu tourism center and set to the for the whole day encounter. The adjacent wetland of Bigodi also has 138 species of birds which offers birding extensions in Kibale National Park. The birding encounter in Kibale National Park commences at7am at Kanyanchu before heading to the jungle of Kibale National Park where you will encounter a range of birds alongside other offerings like fauna and flora. The adjacent Bigodi wetland is a home. 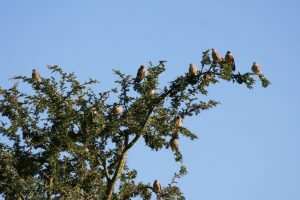 This birding safari tour activity may expose you to birds like; Rwenzori Turaco, Crested fly catcher, Red Winged Francolin, Red- chested fluff tail, Red Winged Francolin, Joyful Greenbul, Green- brested Pitta, Grey winged Robbin, Red Winged Francolin and Abyssinian Ground Thrush among others. The birding encounter in Kibale is conducted throughout the year though the months of March and May and between September and November offer best rewards. The migratory birds are always present in November to April. The surrounding tribal groups of the Batooro and Bakiga have got their cultural traditions and practices that can be encountered while on safari in Uganda. They have impressive music dance and drama and good handicrafts that you select a souvenir to commemorate your safari. The community has got its community tourism project which surrounds Bigodi wetland. They have blended nature and culture and they offer rewarding eco-tourism encounters. The park has got well designed trails that offer impressive nature walks. The range of flora and fauna can be explored on foot. 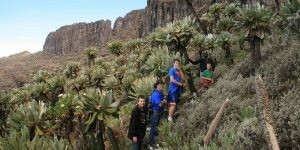 The guides will equip you with indigenous knowledge of various flora and its significance including medicine. The Night walks are also conducted which enables you to encounter nocturnal like tree hyrax, bush babies, cricket, nightjar, and civet and seval cat. The night walks start at 7:30 pm local time and tend to last 1 ½ – 2 hours. Primate Lodge is an upmarket accommodation facility that is located close to the Kanyanchu tourism Center with in Kibale Forest National Park. Due to its location, it offers perfect ground for all activities in the park including the Chimpanzee trekking and Chimpanzee habituation which requires waking up early. Though it an up-market facility, Primate Lodge also deals in mid-market clientele. Accommodation is offered in eight (8) luxury tents, Sky tree house and a camp site. Apart from campsite which has shared ablutions, other accommodation units have en suite ablutions, comfortable beds crafted from eco-materials with private terraces to give impressive views of the forest. Primate Lodge features internet in public areas. This is located in the northern part of the park. It offers accommodation with the maximum capacity of eleven beds. It has no electricity yet but comfortable twin rooms with en-suite bathrooms. The shower has cold water but hot water would be available on request. The campsite has fair range of foods. Kanyanchu River Camp has four (4) bandas each with two (2) beds and fitted beddings. The establishment also has one self-catering banda and two (2) basic campsites. The place has got a canteen that provides food upon request and is open from 7:30am to midnight. You need to inform the canteen one hour in advance to avoid inconveniences. The Kanyanchu River Camp also has a tree house with two (2) people capacity and getting to it from the camp takes 10 minutes. The lodge is located in Kanyanchu on the way to village of Bigodi, it is positioned on a vantage point with sights of the forest and Ruwenzori Mountains, the portal peaks. The Lodge presently offers 2 rooms on the main building and 5 luxury cottages with en suite washrooms. It offers excellent varieties of cuisine. It has a dining and modern bar. Kibale Forest Camp is located off Fort portal – Kamwenge, adjacent to the park’s edge. Kibale Forest Camp has 10 tents well-furnished occupied by double beds. Every tent contain individual en-suite bathroom with an eco-friendly toilet and a dressing room. The camp also provides budget option in the form of non-self-contained tents. This consists of a basic camping tent furnished with 2 single beds and a solar lighting. Linen is provided. Camping. The well-maintained campsite of Kibale Forest Camp is a little green gem. Bordering the swamp and set in lush surroundings. The sanitary facilities consist of 2 hot showers and 2 flushing toilets. The Chimps net is located in Nyabubale village between Nkingo and Bigodi. The connection from this lodge to Kanyanchu tourism center takes about 15 minutes and is close the Bigodi wetland sanctuary. It offers accommodation two (2) tree houses with 3 people occupancy capacity and in built ablutions, self-contained cottages, and family cottage with two bed rooms with six (6) people maximum occupancy in the two bed rooms. The lodge is positioned close to a small village of Nyabubale, in the middle of Bigodi and Nkingo. The lodge takes over 15-minutes to connect to Kanyanchu, the starting point of UWA chimp-tracking and other activities in Kibale Forest. The lodge is also adjacent to the swamps of Bigodi. Mantana Tented Camp is 2kms past the Kanyanchu National Park office before Bigodi Village. It has seven fully furnished tents with enough space, verandah twin bedroom, dressing area, En-suite shower and toilet. The lodge also contains a well-stocked bar and dining. Safari Hotel Bigodi is a paradise for Backpackers and campers. Situated in lush green countryside on the Bigodi – Kamwenge Road, the lodge has single, double rooms, a large camping area and 4 bandas. Meals are prepared. Safari Hotel Bigodi also has laundry service, hot showers, and camp fire and pit latrine toilets. Nyinabulitwa resort is positioned approximately 20km from Fort portal in the west of Uganda. The resort offers upmarket accommodation in their luxury cottages and affordable option on camping arrangement. The accommodation establishment has modern facilities, restaurant overlooking the Crater Lake and solar powered electricity. The Kitchen is well stuffed to prepare locally grown organic food stuffs. The resort also offers a provision for meat roasting by the guests themselves. Positioned at 21 km from Fort Portal town and 10 km from the Kanyanchu visitors center in the Kibale Forest National Park and provide overnight stay to travelers on Uganda safari. The lodge is set on the shores of Crater Lake Nyabikere which literally translates as a lake of frogs facing Ruwenzori Mountains whose snows are visible on pure sky days. The entire rooms including double, single plus the guest house have in built facilities. The campsite and cottages have outside facilities. The stay is based on bed and breakfast unless camping. The CVK resort offer conference facilities, running tap water, electricity, food and drinks, standing showers, flush toilets, visitors only kitchen, secure parking, fire places, swimming in bilharzia free lake. Lake Nkuruba Nature reserve is positioned at 18km from the town of Fort Portal on Rwaihamba road. The accommodation is offered in thatched bandas and self-camping. All bandas are equipped with solar powered electricity and have the occupancy of two to five overnight guests. The security at the reserve is guaranteed with surveillance present 24 hours. The reserve features a dining area and a hut with pit latrines. Kibale National Park id 26km south of Fort portal town. The tourism center Kanyanchu can be accessed from the following points form Kampala; From North passing through Mubende and Fort portal towns or from the south passing through Mbarara and Kamwengye. The northern connection is shorter 358km 7 hours’ drive with only 26km on loose surface road. Kibale can also be accessed by public means as buses transfer from Kampala to Fort Portal while minibuses connect Fort Portal and Bigodi on daily basis.